First, for those of you outside of Washington state, the name Leavenworth may make you think of a high security federal prison but that’s not what comes to mind for Washington staters. No, we think of a little Bavarian town just on the east side of the Cascade Mountains. Okay not a real Bavarian town but one that has been designed to resemble a Bavarian town. Located as they are, at the edge of the peaks of the Cascade range, the town folk of Leavenworth decided (several years ago) to take advantage of this location to draw tourists. And so the beginning of their plan and building codes was formulated and now the town truly resembles a Bavarian village. Sometimes this causes a bit of a conundrum for me. I grew up near the town of Mt. Angel, Oregon that looks nothing like a Bavarian village or any other German community. Yet the town has a strong German heritage and has one of the best Oktoberfests around. It actually feels German to me. 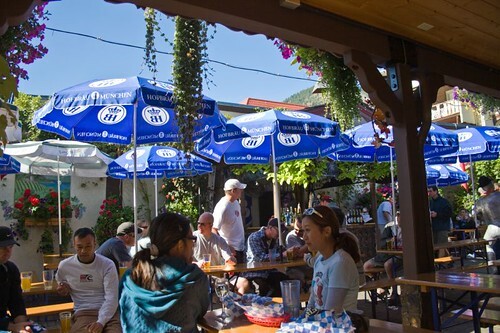 Leavenworth looks German but doesn’t really feel it; still it’s a fun destination especially at this time of year when the leaves are turning color and the trip across Stevens Pass can be filled with the bright hues of fall. This past weekend I took a quick trip over hoping to catch some of the fall foliage. Unfortunately, while the weather was perfect for photo opportunities the leaves had yet to really start turning. Just hints of color peeked out through the trees. I think two more weeks will find the color hitting its peak. 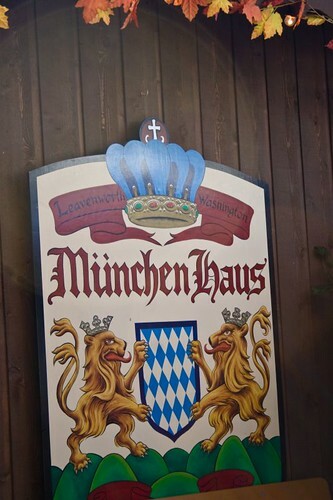 I still enjoyed the trip across the mountains and I took the opportunity to eat lunch at a place that I’d noticed a year or two ago, Munchen Haus. Munchen Haus is an outdoor grill with a seating area wedged between two buildings along the main street in Leavenworth. Normally the lines and the smoke spewing from the grill draw your attention. There is courtyard seating surrounding a beer and wine bar and it seems to always be filled with lively conversation and activity. Munchen Haus serves one thing – although there are several types – grilled sausages. And there are a variety of beverages, including several German beers, to go along with the sausage. I arrived in town fairly early and took advantage of the short lines to see if the apparent popularity was deserved. I ordered a Beer Brat, a bag of chips and a bottle of water. I was handed one of those buzzy, light up discs that some restaurants use to notify you that they are ready to seat you or that your order is ready. I found a place in the sun, munched on my chips and waited for my dog. Several minutes later I picked it up at the grill and then had to choose which of the various mustards, ketchups and relishes to garnish it with. They have an especially large selection of mustard. Along with the normal condiments there’s also a big pot of warm, apple cider sauerkraut. I picked my toppings and then did the taste test. Really, really good! 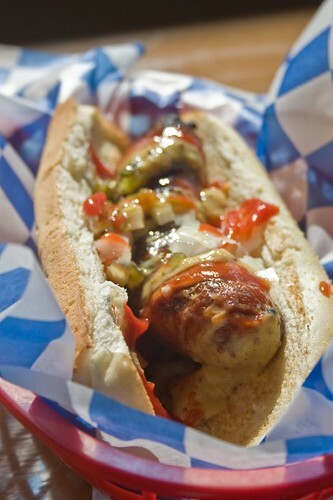 Beer Brats are first cooked in beer making them extra juicy and adding a nice tang to the spicy meat. Then this one was grilled to a nice crispy finish that left the inside moist. Served on a hoagie roll, once you add your choice of garnishes you have a pretty perfect meal. And if you don’t, it’s probably your own fault! So next time I’m in town, I’d probably even wait in line for one of these grilled sausages. And this is a really reasonably priced meal, too. My order came to $8.50 and the bottle of water was pretty large. Not bad for a filling and delicious lunch.